Split PST file by year, date, folder and size into smaller parts. Break both ANSI & UNICODE type PST file with no size limitation. Split Outlook file when a new PST is added by a user in Outlook. Divide Outlook contacts, calendar, emails, attachments, and all other items in PST. Corrupted PST file can also be divided but they need to recover first. Compatible with Outlook 2003, 2007, 2010, 2013, 2016 and all available versions. Users who use Outlook as their email client application would be facing an issue of oversized PST files and thus damaged data in that PST file/folder. To prevent the data loss and to avoid other file related issues that makes the Outlook performance poor, one can break PST files into smaller files. This process of dividing PST files can be carried out with the Split PST software, which can be downloaded for free. Easy to understand Interface: One of the main advantage of this tool is its user interface which is designed with the aim to provide easy layout so that user can understand and perform the steps without any inconsistency. Split PST by year: With this option, users can break their Outlook file that is very old by allowing to create an archive on a yearly basis. Split PST by folder: This is another option by which a user will be able to split large folder into multiple folders for better file management. Split PST by date: With this option, an Outlook user can break the particular PST file into multiple parts between two dates by providing “From date” and “To date”. Split PST file by size: This feature enable a user to break Outlook PST file by providing size of the file. Keep Outlook data safe: All meta data and email properties are kept intact after dividing Outlook PST file of heavy size. Divide Outlook Contacts: Split Outlook contact group or list along with all rows and columns details to the possible number of smaller contacts folder or file without doing any changes in the Contacts data. When Outlook starts behaving passively with reduced rate in performing the functions then make sure that the size of PST file is matching the standard file size limitation because this problem basically arise due to the increased file size. Increased PST file size is issues that need to be solved immediately as it will be problematic when the data stored in Outlook data file reaches near to the limited size of 2GB. In this scenario, PST Splitter tool will help to divide the data of a large PST file into smaller Outlook file without any alteration to the data. 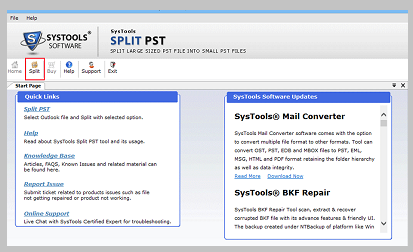 Split PST software provides users a trial version before getting the full license of the tool. It helps a user to understand the complete working of the software and get the personal experience that how PST splitter tool can be helpful to the users. Using demo version of the tool, you can split PST file items if they are few in numbers but for splitting a larger size Outlook data file, you can go through the full version of PST Splitter. Does this software support splitting of unlimited PST files? Yes, the PST splitter tool can break PST file of any size into suitable number of smaller Outlook file. What Windows platforms, does Split PST software support? The tool is compatible with Windows 8.1, Windows 8, Windows 7, and all below version. 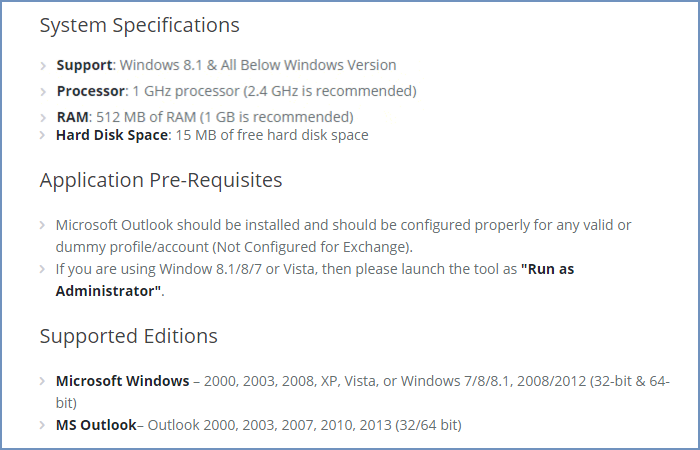 Can this tool perform split operation without Outlook installation? No, it requires installation of MS Outlook in the computer where you are going to use PST Split software. Can this tool split corrupt PST file? No, the software only break bug free PST file. But, if you have corrupted Outlook data file to split, then you must remove them first. Once after restoring damaged file, you can proceed further with PST splitter tool for performing split operation. Does the software split Outlook archive files too? Yes, it can split archive PST files of N GB in size.